This is in response to your letter of October 17, 1990, to OSHA's Region V Office, requesting interpretations on the Laboratory Standard, 29 CFR 1910.1450. Your letter has been forwarded to the National Office for response. We apologize for the delay. Does 29 CFR 1910.1450 cover quality control laboratories where these facilities support the production process through sample analysis? NOTE: See attached interpretation from Avenel area office. The preamble to the standard indicates that most quality control (QC) laboratories are not expected to qualify for coverage under the Laboratory Standard, since they are usually adjuncts of production operations which typically perform repetitive procedures for the purpose for assuring reliability of a product or a process. This response does not contradict the letter from OSHA's Avenel Area Office. If samples are taken during different phases of the production process to verify quality control of the process, would these labs be covered under 1910.1450 or under 29 CFR 1910.1200? These labs assuring quality control of the production process would not be covered under 1910.1450 but would be covered under other general industry standards including 29 CFR 1910.1200. Are environmental labs performing analysis on samples for compliance under EPA regulations covered by the Lab Standard? Yes. Most if not all of these laboratories are not conducting quality control of production processes but are monitoring emissions for environmental control purposes; therefore, they are not exempted from the Laboratory Standard. Such operations would only be considered quality control of production if the result of the monitoring is used as a source of information for process control adjustment. If making secondary standards is part of the quality control of a production process, the Laboratory Standard would not be applicable. 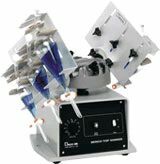 If blending operations result in a product, they would be considered as production processes and not be within the scope of the Laboratory Standard. Request specific clarifications of the following conditions defined under "laboratory use of hazardous chemicals," including: chemical manipulations, production versus non-production, and multiple use of chemicals. Chemical manipulation simply means the use of chemicals. Production means an operation where a product is produced. Examples of production facilities are refineries, utility- generating companies, manufacturing plants. Multiple use of chemicals (the actual wording in the standard is "multiple chemical procedures or chemicals are used") means using chemicals in laboratory procedures. Your letter also addressed a concern that QC labs have limited coverage under 29 CFR 1910.1200, and no coverage under the laboratory standard. We are enclosing pages A-3 and A-4 of the updated Hazard Communication directive, CPL 2-2.38C for your information. The coverage of laboratories is limited under the Hazard Communication Standard (HCS) because it was expected that most laboratories would be covered by the Laboratory Standard. However, the directive does state that QC laboratories would generally be covered by the HCS. Please note that in the previous directive, there was no reference to limited coverage of QC labs under HCS as you had inferred. We hope we have adequately addressed your concerns. If we can be of further assistance, please do not hesitate to contact us. Mix things up around the lab with automatic shakers from Safety Emporium.